A single prototype was assembled in October 1954, also serving as the design team’s model for determining the final placement of trim and badges; there had been no time for full-size clays or even scale models. 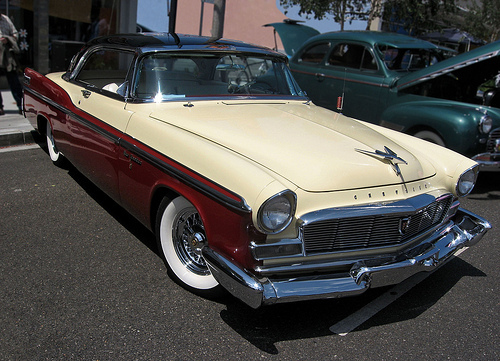 Mechanically, the car was essentially a 1955 Chrysler New Yorker Deluxe two-door hardtop with stiff “export” shock absorbers and heavy-duty springs, some 60% stiffer than the standard New Yorker’s. 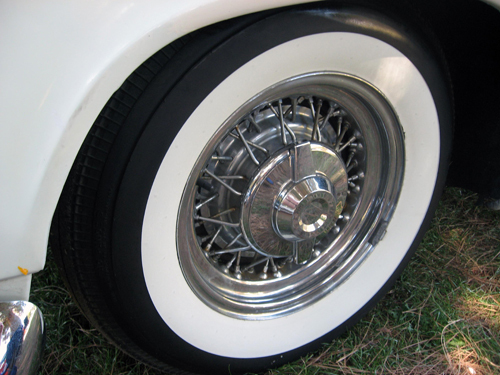 Brakes were the same as the Imperial’s, 12-inch (305 mm) Lockheed drums with a Kelsey-Hayes booster, while the tires were six-ply 8.00×15 Goodyear Super Cushion whitewalls. 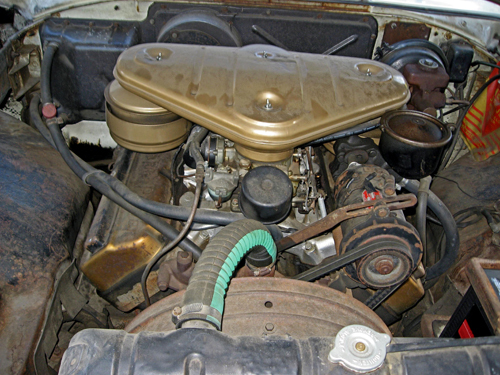 Under the hood was a high-performance version of the 331 cu. in. (5,425 cc) FirePower V8 in a state of tune very similar to that of Cunningham’s C-4R Le Mans cars, with a special intake manifold, a much hotter camshaft, solid lifters, and multiple carburetors, albeit two four-barrel Carter carburetors rather than the Cunningham’s four Zenith two-throats. The result was 300 gross horsepower (224 kW) at 5,200 rpm and 342 lb-ft (464 N-m) of torque at 3,200 rpm, numbers that hadn’t been seen on an American production engine since the supercharged Duesenberg Model SJ of the early 1930s. The engine was backed by a beefed-up PowerFlite automatic transmission, although a single car was later fitted with a three-speed manual transmission. Quinn and Braden were uneasy about the prototype’s rakishly lowered (and very stiff) suspension and loping idle, but Quinn became much more enthusiastic once Rodger convinced him to drive the car. The new model was quickly approved and slated for introduction later in the 1955 model year. Production began in January. To emphasize the fact that the new model was America’s most powerful production car, it would be called simply Chrysler 300. To avoid the logistical problems and production delays that would have resulted from trying to build the 300 on the same line as the New Yorker and Windsor, the 300 was built alongside the Imperial. Each completed car was road-tested before delivery. The Chrysler 300 was announced on January 17 and went on sale in early February. List price was $4,055.25 FOB Detroit, which included power brakes and PowerFlite, but not a heater or power steering, both of which were extra-cost options. Air conditioning was theoretically unavailable, although at least three cars were so equipped. Even without air, a fully loaded 300 with wire wheels had an advertised delivered price of more than $5,000, a Cadillac price tag in those days. That price tag bought one of the most muscular production cars of its era; the Chrysler 300 was 135 lb (61 kg) lighter than the already respectably quick New Yorker hardtop and boasted an additional 50 horsepower (37 kW). Admittedly, the highly tuned engine suffered a bit at lower engine speeds, which, combined with a two-speed automatic and 4,300 lb (1,950 kg) of curb weight, made the 300 a little sleepy below about 40 mph (65 km/h). Still, a 10-second 0-60 mph (0-97 km/h) time put the 300 in the upper echelon of American performance cars. A Thunderbird, Buick Century, or V8 Chevrolet could outmatch the 300 up to freeway speeds, but after that, the big Chrysler would leave most of those cars behind. Despite its substantial bulk, the 300 handled well, its lower center of gravity and stiffer springs keeping body lean in check. The 300’s Achilles’ heel was its steering, which offered the same unhappy tradeoff as other Chrysler products: The non-power steering was frustratingly slow (5.5 turns lock-to-lock), while the optional Hydraguide power assist was quick but almost totally lacking in feel, hardly confidence-inspiring in the sort of driving the 300 otherwise encouraged. Other debits were the front bench seat, which lacked any lateral support (or seat belts, although these became optional late in the year) and had slippery leather upholstery, and the brakes, which were not up to the standard set by the engine. While the Chrysler 300 was no sports car, it was one of the first big American cars that could be called a sports sedan with a straight face. It was not as nimble as an MGA or Triumph TR3, but in compensation, there was room for six and a cavernous trunk. Even ride quality was decent, if a little stiff-legged, a dividend of the 300’s ample sprung weight. If you didn’t mind the rough idle, the 300 was a comfortable, attractive, sure-footed plus-size touring car that could handily dust a variety of ostensibly sportier opponents. 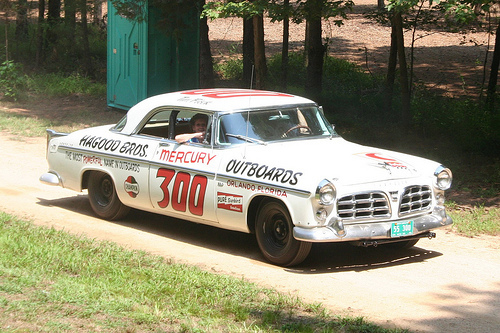 The Chrysler 300 arrived just in time for the speed trials at the 1955 Daytona Speed Weeks. On the sand, the new car quickly demonstrated that it was as formidable as the specifications suggested. While the 300 didn’t excel in the standing-start trials, it finished one-two-three in the flying mile, with pilot Warren Koechling setting a new two-way record at 127.58 mph (205.4 km/h), followed by Brewster Shaw (who’d set the previous record in a 1954 New Yorker) and Vicki Wood. Stock car driver Tim Flock drove another 300 in the 160-mile (258-km) Daytona Beach Grand National, averaging more than 92 mph (148 km/h) to finish second, but he was belatedly declared the winner after the disqualification of first-place finisher Fireball Roberts’ Buick. Technicality or not, Flock’s victory was the first NASCAR win for the indefatigable Carl Kiekhaefer. Although Kiekhaefer had sat out the 1954 Carrera Panamericana, his interest in racing had not abated. His drivers had won three 1954 AAA stock car races in New Yorker club coupes and as soon as the 300 became available, he bought an early-production example and took it to Florida to look for drivers. He hired Flock in Daytona, subsequently adding to the ranks Frank Mundy, Buck Baker, Tony Bettenhausen, Norm Nelson, Speedy Thompson, and Flock’s older brother, Truman Fontello “Fonty” Flock. Kiekhaefer was not an easy man to work for — he was a demanding workaholic and employees or business partners had to be prepared for calls in the middle of the night — but the Mercury Outboard Team was the best-prepared and best-paid in stock car racing. While Kiekhaefer funded the Mercury Outboard cars himself, he also had no qualms about calling Chrysler engineers in Highland Park at all hours for technical support, which Chrysler, mindful of the potential publicity involved, was quick to provide. The Mercury Outboard 300s were too big to be strong contenders in short-track events, but Kiekhaefer’s drivers were almost unstoppable in the NASCAR Grand National series, winning 23 races out of 39 starts. Eighteen of those victories went to Tim Flock, who won the driver’s championship by a commanding margin. Mercury Marine Chryslers also took 14 AAA stock car victories, 10 of them won by Frank Mundy, and Chrysler claimed the manufacturers championship for both series. The Kiekhaefer 300s would probably have been highly competitive in the Carrera Panamericana, but the Mexican road race was no more, canceled after the 1954 event. Considering its price, hard-edged nature, and late introduction, it’s no surprise that the 1955 Chrysler 300 wasn’t a big seller for Chrysler — total production amounted to only 1,692 cars for the U.S. market, plus an additional 33 for export — but its publicity value was considerable. The 300’s competition and speed trial exploits were featured extensively in Chrysler advertising, perhaps the most visible symbol of how far the company had come over the past five years. The more important signs, as far as Chrysler’s directors were concerned, were on the balance sheet, which was considerably cheerier than in 1954. Chrysler’s total volume nearly doubled to around 1.6 million units, a new record, and the company’s total market share improved to more than 17%, short of the 20% company officials had hoped for, but reassuring after the dismal 1954 model year. While a greatly improved product line played no small part in that success, Chrysler’s 1955 revival must also be considered in the context of the industry as a whole. The 1955 model year broke sales records across the board: Total U.S. new car sales reached nearly 7.5 million, exceeding the industry’s most optimistic projections by more than 20%. However, much of that growth was due to aggressive promotions and easy credit, neither of which was sustainable. The default rate on new car loans was alarmingly high and the explosion in consumer credit led the Federal Reserve Board to raise the prime lending rate in an effort to stave off inflation. The outlook for the 1956 model year was less rosy. Chrysler’s 1956 model debuted in October 1955, with a modest facelift Chrysler advertising copy dubbed “Powerstyle.” The touched-up look included the inevitable new grilles and bumpers, a new four-door hardtop body style, and the first flush of Virgil Exner’s latest stylistic fascination: “Flightswept” tailfins. 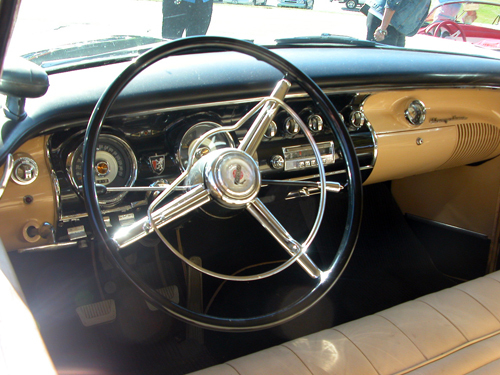 The 1956 cars also introduced what would become another characteristic Chrysler feature: pushbutton automatic transmission controls. 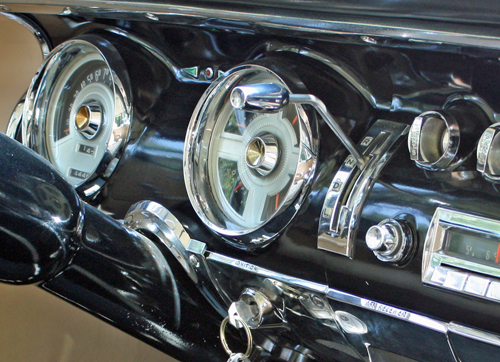 Unlike the contemporary Packard system, which was electrically operated and rather troublesome, the Chrysler system was purely mechanical; engaging a button changed the effective length of the shift cable, just like moving a column- or console-mounted shift lever. According to stylist Harold Pilkey, then the head of the Plymouth studio, the pushbuttons were inspired by a chance encounter with a Ford fitted with what was presumably a prototype of the pushbutton shifting system later used in Mercurys and Edsels. However, the Chrysler system would be considerably longer-lived, surviving through 1964. 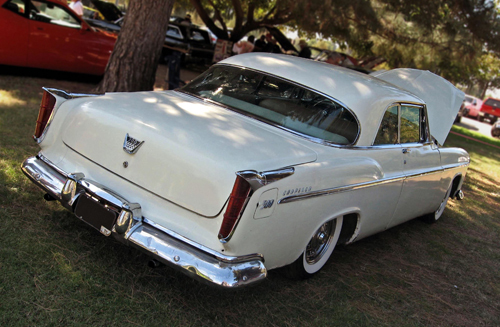 Most of Chrysler’s V8 engines were enlarged for 1956, including the Chrysler/Imperial FirePower, which was bored 0.125 inches (3.1 mm), bringing displacement to 354 cu. in. (5,787 cc). The compression ration increased to 9.0:1 and both intake and exhaust valves were enlarged, to 1.94 inches (49.2 mm) and 1.75 inches (44.5 mm) respectively. These changes added 30 gross horsepower (22 kW) and, more importantly, 40 lb-ft (54 N-m) of torque — useful given the greater weight of the facelifted bodies. Other changes included a switch from a 6-volt to a 12-volt electrical system and the adoption of Chrysler’s new “Center Plane” drum brakes with dual leading shoes. The 1956 edition of the 300 debuted at the Chicago Auto Show in January 1956. To distinguish the new model from the original, Chrysler appended the letter B to the designation, making the new car the 1956 Chrysler 300B. Despite its name, the 1956 Chrysler 300B now had a good deal more than 300 gross horsepower: Applying the original 300’s hot solid-lifter cam and dual carburetors to the latest 354 cu. in. (5,787 cc) FirePower V8 yielded 340 gross horsepower (254 kW) and 385 lb-ft (522 N-m) of torque. The 300B engine was also fortified with heavy-duty bearings and a hardened crankshaft for greater durability at racing speeds. Another competition-focused addition, arriving in mid-summer, was an even hotter engine with new heads and 10.0:1 compression, raising advertised output to 355 gross horsepower (265 kW) and 405 lb-ft (549 N-m) of torque. Much ballyhooed in later years as the first American production engine making 1 (gross) horsepower per cubic inch (61 hp/liter), the high-compression engine was introduced purely for the benefit of Kiekhaefer and company; few, if any, of these engines were installed in non-race cars. Other changes to the 300B mirrored those of other Chryslers: new be-finned rear fenders and rear bumper, Center Plane brakes (no bigger than a New Yorker’s and inadequate for the much faster 300), and pushbutton shift controls. PowerFlite was once again standard, but for $70 extra, purists could now specify a heavy-duty clutch and the Dodge-supplied three-speed manual transmission nominally standard on the Windsor. A considerably more useful alternative, added late in the model run, was Chrysler’s new three-speed automatic, the A-488 TorqueFlite. Based on patents licensed from inventor Howard W. Simpson, TorqueFlite had two planetary gearsets sharing a single sun gear, which made for a transmission only a little heavier than the two-speed PowerFlite. TorqueFlite’s 2.45 low ratio (combined with a torque converter with a 2.3:1 stall ratio) gave considerably better low-speed pickup than the two-speed transmission, while the 1.45 second provided a much-needed passing gear. TorqueFlite proved just as durable as PowerFlite, with a similar combination of positive response and smooth shifts. 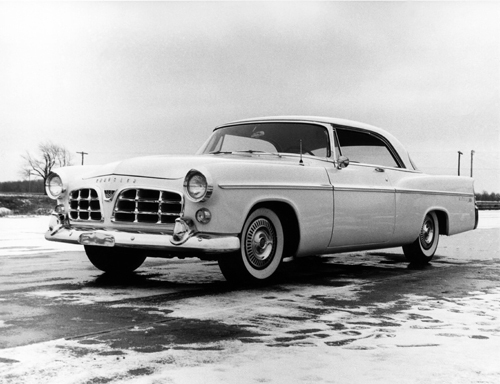 The 1956 Chrysler 300B was about 150 lb (68 kg) heavier than the original 300, but the extra power and torque gave performance a shot in the arm. Low-speed acceleration remained a little soft, but cars with the standard engine and PowerFlite were now capable of 0-60 mph (0-97 km/h) in around 9 seconds; the three-speed manual transmission trimmed an additional second from that figure. (The only road test we’ve found of a TorqueFlite-equipped car included no timed acceleration figures, but we suspect the three-speed automatic would split the difference between the PowerFlite and lighter stick-shift cars.) Top speed with the more sensible of the many available axle ratios was sufficient to preserve the 300B’s status as one of the fastest — if not the fastest — stock cars in America. The 300B’s competition in that arena now included a number of other Chrysler products. The promotional value of the original 300 hadn’t been lost on the heads of the other divisions. 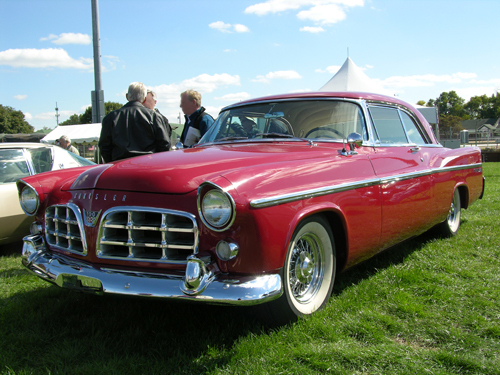 Midway through the 1956 model year, each of Chrysler’s automotive brands received its own performance model. In December, before the Chrysler 300B debuted, Dodge introduced its entry, the D-500, initially a Royal Lancer with heavy-duty chassis and drivetrain components, oversize Center Plane brakes, and a 315 cu. in. (5,147 cc) Red Ram engine with 260 hp (194 kW). In January came the Plymouth Fury, with a 240 hp (179 kW) Canadian-built 303 cu. in. (4,957 cc) engine, heavy-duty suspension, and special trim, followed in February by the DeSoto Adventurer a well-trimmed Fireflite Sportsman with a dual-carburetor 341 cu. in. (5,594 cc) “FireDome” Hemi and 320 hp (239 kW). While none of these cars was as powerful as the 300B, they were lighter and significantly cheaper than the Chrysler, whose base price had climbed to more than $4,300. I attended the Auburn, Indiana show one year. A couple dozen Duesenbergs, a bunch of Cords and Auburns all parked around the town square. And what car do I remember most vividly from that day? A ’55 Forward Look 300 – cream color, driving around with the windows down and that big open hardtop roof looking so handsome. What a beautiful car. It is a very handsome car. From a practical standpoint, I could quibble about the lack of outside mirrors and backup lights, but I think it’s the best-looking of the 1955 Chryslers. Another great story on an interesting time in Chrysler Corporation’s history. The 1955 Chrysler 300 is the best-looking of the bunch, but all of the firm’s 1955 products are quite handsome. The “standard” 1955 Chryslers and DeSotos are, in my opinion, better-looking than that year’s Buicks and Oldsmobiles. The 1955 Dodge held its own with the 1955 Pontiac. The 1955 Dodges are much better-looking than that year’s Mercury, which looks like a Ford with too much chrome and glitter. I am surprised that the firm’s market share dipped so much for 1956. While that was a down year for everyone, the Chrysler Corporation cars were still quite handsome, and fully competitive in regards to features and build quality. I wonder if the problem was the relative weakness of Plymouth next to Chevrolet and Ford. Dodge and DeSoto were certainly competitive with Mercury, and Ford didn’t have a competitor to Chrysler (Edsel was supposed to solve that problem, if I recall correctly). But Plymouth never came close to matching Ford Division’s sales, and thus the Ford Motor Company easily outsold all of Chrysler Corporation. One minor quibble – the red car in the last photo is a 1959 300E, not a 1957 300C. The 1959 model had a different taillight and rear bumper design than the 1957 and 1958 300s. The 1959 Chryslers did use the same basic body as the 1957 models. Thanks for the photo correction. I didn’t look at it closely enough and the photo isn’t quite big enough to read the badges of the B.G. car. If I were to guess, Chrysler’s problem in ’56 was directly related to lenders putting the brakes on consumer credit after 1955’s high default rate. Chrysler — particularly the senior cars — was frequently more expensive than direct competitors, sometimes by a lot, so the reduced ability to spread out that extra cost over a longer-term loan may have been a bigger problem than for some cheaper rivals. Compare Buick and Chrysler prices and you’ll see what I mean. Wonderful article on one of my favorite subjects. The 1956 Chrysler line is one of my all-time favorites, with the 300B being perhaps the best looking of the lot. 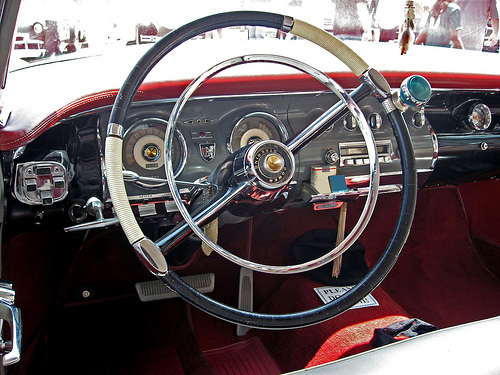 The dashboards of the 55-56 models were simply beautiful. As a teen, I was given a handful of brochures for the 300B and read it over and over. The car remains one of my primary lust objects. I thought I remembered hearing that there were starting to be quibbles about the build-quality of Chrysler’s bodies. Chrysler bought the Briggs Body Company (in 1954, IIRC, which left Packard in a bit of a lurch). I have heard arguments that Chrysler-built bodies were never of the quality of the Briggs-built units. I have always wondered also if the pushbutton transmission controls did not put off some buyers. 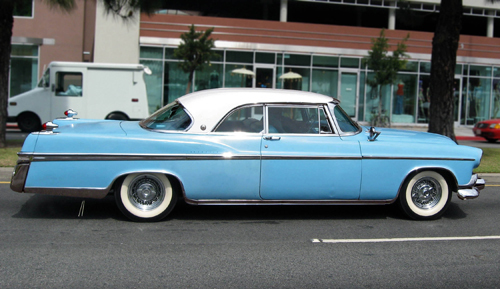 The uncle I wrote about earlier had a ’55 New Yorker, royal blue body, baby blue top. A very handsome car which Popular Mechanic’s automobile writer called the best car in 1955. That year’s Plymouth would have out-sold the Ford of that year if people were able to distinguish quality. An uncle had a ’55 Plymouth; my father’s ’55 Ford was quite crude in comparison. I would love to park that St. Regis in front of my home. I cannot say that for any of the cars currently being manufactured. Lastly, thank your for another scholarly article. Sometimes the right constraints can make a car a classic. The imperial grill makes the 300 awesome! If they had used the 56 new Yorker grill I would only have had a passing interest in this car. That grill is about as boring as a Studebaker President. Another note. Does anyone else think the Volvo Amazon looks like a scaled down version of the 55-56 imperial? The grill and 4-door roofline look similar to me. In re: the Amazon, I had never thought of that, but you’re right. I don’t know if it’s intentional or not — I know the designers have said they were looking at American cars, including Kaisers, so it’s possible. I remember reading somewhere, one time, that the reason for the Dash mounted Auto Trans stalk on the ’55s was that they had hoped to have the pushbuttons ready for them but fell behind and the steering column was already firmed up for that year. So with the PB’s not ready and the column already locked in, the stalk on the dash was a last minute compromise. Anyone else ever hear that one ? Well, the logistics of production engineering being what they are, Chrysler would certainly have known before the ’55 cars went on sale that the dashboard lever would be replaced by the pushbuttons for ’56, so in that sense you could call the dashboard shift lever an interim design. The question is (assuming Hal Pilkey’s account about the pushbuttons being inspired by a Ford prototype somebody saw on the highway was true) exactly when Chrysler decided to do the pushbuttons. Unless that was before June 1953, I think the dashboard lever was conceived first. Even if the pushbuttons were conceived first (which is possible — I just don’t know), the idea that the dashboard lever was a hasty substitution doesn’t make a lot of sense. I would think that a metal dashboard would represent a bigger tooling investment than a steering column cover, and a dashboard shifter would require a new linkage, whereas the column shifter linkage could presumably be adapted from the ’54. So, that part seems like a stretch. Paul Dietzel’s theory makes sense to me. Having maintained the first F-16C’s at Ramstein AB back in ’86, I can attest that not everything is ready for the show when the curtain goes up. Given this site’s thorough approach to auto history, we’re as likely to read it here as anywhere else. Short of interviewing engineering staff of the day, how to know? My dad gave me my first car (in 1967), a 1955 DeSoto Fireflite, Powerflite shift on dash. My last Mopar was a 1964 Imperial I owned until 2004. Pushbutton shift. Though I was young and it was a long time ago, the dash shift seemed to be a relatively simple, elegant and reliable solution. On the DeSoto at least, tooling shouldn’t have involved much more than the driver’s side instrument panel and some bracing. To me, it seemed to be simpler than running linkage up the steering column. I’m led to believe that Chrysler could have easily come up with this in a pinch, as Paul suggests. The pushbutton shift, though it may have been cheaper to manufacture (I have no idea), involved more moving parts. In my 1964 Imperial, anything beyond the most minor maintenence to this unit requires removing much of the dashboard, a daunting task. I can also well imagine a production delay trying to get the buttons, springs, levers and detents to work reliably and predictabably in the push-button prototypes. Push-button shifting was uncharted waters. A simple lever on the dash was easy stuff to work out in a pinch. Pictures of the 1952 Imperial presidential parade car interior in Jay Leno’s show a column dash, lend some additional credence. The ’52 is a finished styling work, writing the “forward look” in stone. The dashboard was strictly functional, not at all styled. It’s not a show car, but a functioning, custom built, state coach. So anyhow, in my (former) Mopar mind, Paul Dietzel’s theory makes sense. Petty said this was THE FIRST TorqueFlite car, the test mule. The specific piece of Paul’s comment that I’m a little dubious about is really just the “last-minute” part, which may come down to the fact that auto industry lead times are longer than a casual observer would likely intuit. It’s certainly possible that all of these things are true: that Pilkey’s account is accurate, that the dash lever was designed first, and that the latter was substituted for the former because getting the buttons to work reliably was going to require more time. It comes down to when each design was conceived and the timeline for each, which isn’t really knowable without access to internal documents that even FCA probably no longer has. There’s no question that the pushbuttons were a gimmick, of course; they were an indulgently and probably relatively expensively futuristic touch for an era that was still very excited about the future. These two articles on 1950’s Chryslers really brought back some memories. In 1952, my parents(OK, my dad) bought a New Yorker. It was two-tone green, that is, light green top with the body in aqua. I don’t recall the interior. I didn’t get to drive it as I was nine years old, but it was the first new car that my family had. In 1955, my dad bought another New Yorker. It was black and red, and therein lies a tale. The top was red and the body black, but the standard New Yorker had the side “spear” also in black. My dad put pressure on the dealer and got the spear done in red. Very sharp looking and possibly unique (?). The interior was in light blue fabric. I learned to drive in this car, and also the next car, which was a 1958 Imperial four-door hardtop. Now we were a two-car family,as my Mom had been sharing a Ford two-door hardtop with my aunt. Well, I beat the heck out of it,driving it like a sports car (!) and my dad switched to Lincolns for himself and Ford wagons for my mom.